With university degrees no longer rewarding students with a guarantee of full-time work, there’s a greater need for alternate education and employment pathways. Apprenticeships and traineeships are a great way to train people in occupations and industries that are experiencing high demand. For businesses, hiring apprentices and trainees is a great option because it involves taking on workers that are highly engaged and ready to learn practical skills. It allows businesses to develop employees that are trained to the specific needs of a company. Apprenticeships and traineeships are commonly associated with trade skills, but vocational training is available in almost every single occupation. A simple SEEK search shows there are thousands of jobs available right now for the following apprenticeships and traineeships – if your business falls under these areas, then it might be time for you to join the search. According to SEEK there are 7,483 jobs currently available in childcare, making it one of the more popular vocational areas you can get into through a traineeship. A Diploma of Early Childhood Education and Care qualifies an individual to work as an early childhood educator or outside school hours aide, with pathways to become a team leader or childhood education manager. This qualification can lead to a broad range of careers. Traineeships can lead to entry-level positions such as office manager, general clerk, personal assistant, or even accounts clerk, with possible pathways for more senior positions There are currently 27,127 jobs available on SEEK under business administration. 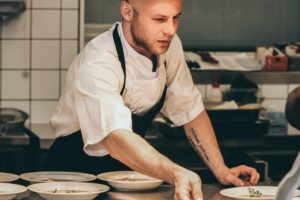 Apprenticeships are a valuable pathway into the hospitality industry. Completing a Certificate in Cookery qualification enables students to work as cooks in a range of environments, from restaurants to cafes, hospitals and even catering businesses. A search for cooks on SEEK currently gives 4,166 results. Of course, the traditional trades are also experiencing a high demand for workers, especially with the skills shortage. There are currently 7,923 electrician jobs on SEEK, and these positions range from general electricians to telecommunications technicians to FIFO workers. Carpentry is another trade that’s in high demand, with 2,099 jobs available on SEEK at the moment. This qualification can lead to jobs as carpenters, joiners or stair builders. As with other trade skills, there’s also the opportunity to start your own business and build from there. *All job figures collected from SEEK and were accurate as of November 22, 2018 Australia wide.